Introduction: When is a backpack more than just a backpack? When it is effectively carrying everything you need for that next successful fishing adventure. Simms has a complete range of packs ranging from small hip packs and sling packs to full size backpacks designed to transport everything you need for a trip in the backcountry. The Simms Headwaters Full Day Pack is designed to hold a complete range of fishing tackle as well as destination essentials to keep you fully geared up on the go, no matter where your next fishing hole is located. Impressions: When I first started walking the shoreline of my local lakes targeting largemouth or fishing for trout residing in small streams in the backcountry I would stuff all my gear in the same backpack that I used every day for school. While my Jansport got the job done I never felt like my gear was organized, nor was the pack very comfortable when loaded up with anything more than five pounds of gear. 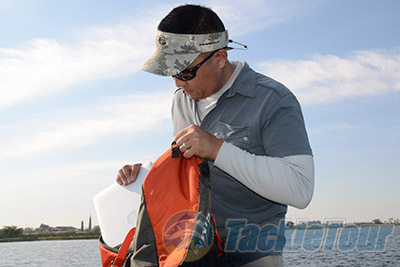 Over the years many tackle storage manufacturers have designed more effective ways to transport your tackle. As is always the case the longer you fish the more tackle you seem to accumulate, and the more important it becomes to have a storage solution that can carry all that �necessary� kit. Sometimes a 15 liter pack is enough for a short hike, but when you need to be prepared for a full day out in the field then a full sized 30 liter pack is more likely the way to go. 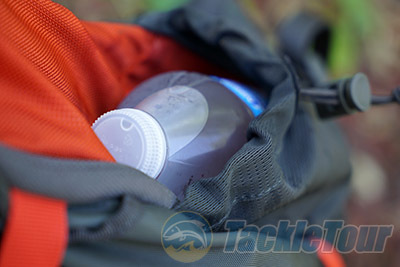 With 30 liters capacity you are able to not only hold your traditional tackle but also extra food, water and even a light jacket or fleece. The Headwaters Full Day Pack is appropriately named as it offers a large amount of storage, 1830 cubic inches to be exact, and the flexibility to handle anything the day brings. The Headwaters FDP (Full Day Pack) is constructed out of 420 denier fabric which is abrasion resistant, and the bottom of the pack is reinforced with even more durable 630 denier fabric. By itself the pack feels reasonably light and weighs only 3 pounds. 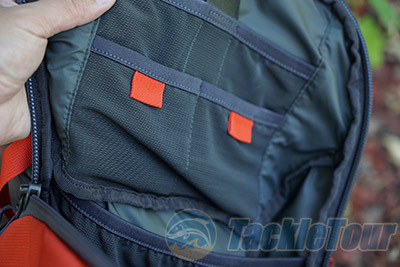 The back of the pack has a rigid bolstering that help maintains the upright structure of the pack, making it easier to load, as well as has a positive impact on the overall ergonomic design of the backpack. 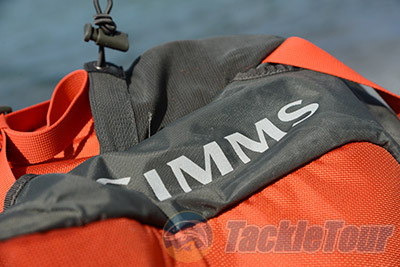 The Headwaters FDP also possesses a modular accessory design that Simms calls the �Catch and Release� system. 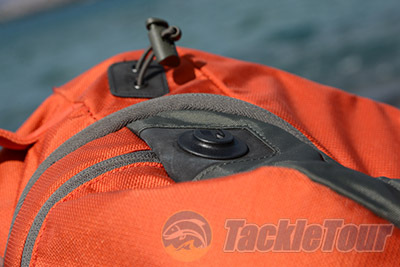 On both the front and back of the backpack anglers will find small circular magnetic receivers that can quickly latch and unlatch smaller Simms bags. 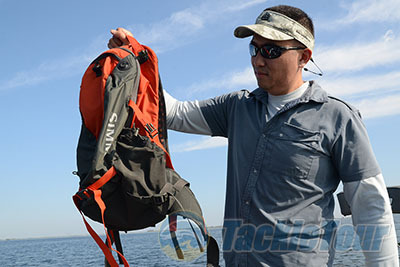 One example is attaching the Headwaters Chest Pack to the back while hiking, then attaching it to the front straps while fishing, which basically converts the Headwaters backpack into a vest/chest pack which provides quick and easy access to fly fishing or traditional fishing tackle.